A rock beast now has a gentler side. That extra pickup offers a lot more options too. Well-made. Tonal range from the single-coil. Those knobs still don't look right. We had a great deal of time for the Blacktop Strat HH. A time-proven chassis, updated with younger players in mind via a pair of rocking humbuckers. The only difference between the HH model and the new HSH is the 'S' bit, the single-coil that nestles between the two humbuckers. And rather than a Strat single-coil, we get a chrome-encased Tele neck job. The Blacktop HSH crams all of its goodies onto an alder body. Like the other three amigos in this round-up, this well-finished guitar's bolt-on maple neck has a slim 'C' profile and 22 large frets, which feel great for string bending. Tuning stability from the Strat vibrato is thankfully well up to snuff, just like the Modern Player Strat HSS. 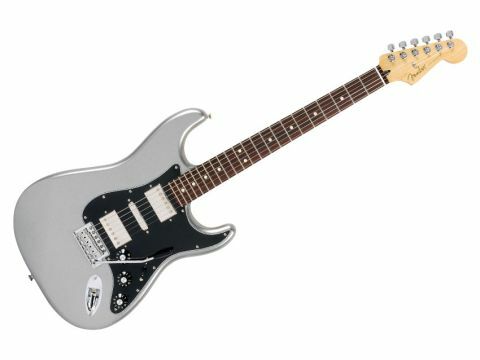 The first generation Blacktop Strat HH was primed to be an out-and-out rock machine. Still going strong, it won plenty of fans thanks to its thick humbucker tones, glassy split coil options and first-class playability. The HSH version offers more of the same. The bruising bridge humbucker still provides the rock and metal goods, while the combination of the split- bridge/split-neck and middle pickup is great for classic rock and R&B rhythm, but the middle pickup sounds damn fine running solo. Strum hard à la Townshend in this position through a clean channel for big-sounding chords with an almost acoustic-like quality.